Dr. Aleksandr V. Gevorkyan is Associate Professor of Economics at the Department of Economics and Finance of the Peter J. Tobin College of Business at St. John’s University in New York City. He is a Senior Research Fellow at the Vincentian Centre for Church and Society, a Research Fellow at the Center for Global Business Stewardship, and a Board Member at the Armenian Economic Association. Dr. Gevorkyan also serves as ad-hoc Economics Subject Matter Expert for the Permanent Observer Mission of the Holy See To the United Nations. Dr. Gevorkyan’s extensive teaching and research experience covers themes in open economy macroeconomics, macroeconomic policy, economic development, international financial economics, labor migration, and post-socialist transition economics. 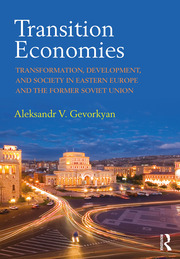 Dr. Gevorkyan is the author of Transition Economies: Transformation, Development, and Society in Eastern Europe and the Former Soviet Union (Routledge, 2018). He is also a co-editor (with Otaviano Canuto) of Financial Deepening and Post-Crisis Development in Emerging Markets (Palgrave MacMillan in 2016). He is also the author of Innovative Fiscal Policy and Economic Development in Transition Economies (Routledge, 2013 in paperback; 2011 in hardcover). Central banks, Commodity markets, Economic development, Emerging markets, Exchange rate, Foreign exchange constraint, Macroeconomic policy, Mandated benefits, Labor migration, Open economy macroeconomics, Post-socialist transition, Sovereign debt.